First, we have the Lise Watier Deep Cleansing Oil (C$35 for 200mL). This cleansing oil is the first step in your skincare routine, helping to remove makeup, sunscreen, and impurities from your skin. I always do a pre-cleanse with a cleansing oil because I find that this is the best way to remove all traces of makeup from my skin. As with other cleansing oils or balms, you apply this on your dry face with dry hands, massage it in to dissolve makeup, add a bit of water and continue massaging to emulsify, then rinse off. I really like this – it does a fantastic job at removing my makeup, with enough slip that I don’t need to apply too much and can still get a good massage in. It emulsifies completely, leaving behind almost no trace. My skin feels comfortable after, thanks to the copious amounts of good oils that it contains, such as sweet almond, macademia, green tea, avocado, and coconut. It’s not a bad price, since you get 200mL of product. It also contains trace amount of Panax Ginseng Root Extract, which is the same ingredient used in La Prairie products. It’s probably a waste though, because cleansers just get washed off. I do like this, and would recommend it. Ingredients: Ethylhexyl Stearate, Ethylhexyl Palmitate, Triethylhexanoin, PEG-20 Glyceryl Triisostearate, Hydrogenated Poly(C6-14 Olefin), Pentaerythrityl Tetraethylhexanoate, Pentaerythrityl Tetraisostearate, 1,2-Hexanediol, Tocopheryl Acetate, Macadamia Ternifolia Seed Oil, Prunus Amygdalus Dulcis (Sweet Almond) Oil, Persea Gratissima (Avocado) Oil, Benzotriazolyl Dodecyl P-Cresol, Pentaerythrityl Tetra-Di-T-Butyl Hydroxyhydrocinnamate, Camellia Sinensis (Green Tea) Seed Oil, Orbignya Oleifera (Babassu) Seed Oil, Cocos Nucifera (Coconut) Oil, Betula Alba Juice, Aqua (Water/Eau), Butylene Glycol, Panax Ginseng Root Extract, Parfum (Fragrance), Phenoxyethanol, Disodium EDTA, Ethylhexylglycerin, Citronellol. The Lise Watier Cooling Cream Foam Cleanser (C$26 for 150mL) is the next step in your skincare routine, after the Deep Cleansing Oil. I don’t believe that you can deeply clean your pores using just one product if you wear makeup, since you’re just massaging the dissolved makeup into your pores as you cleanse, so I always double cleanse with a cleansing foam or gel after my oil. 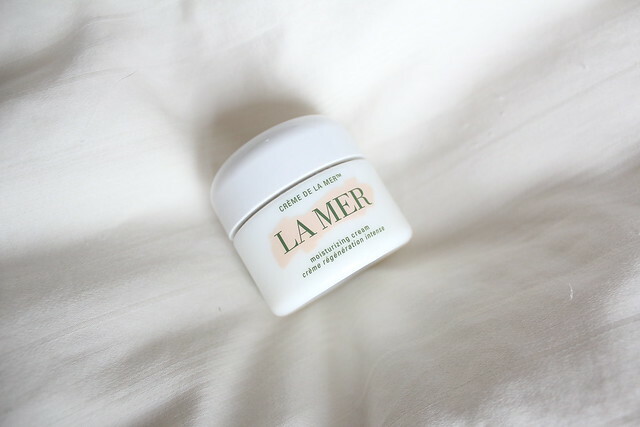 The cooling cream is a bit of an interesting experience – I actually prefer using this in the morning to help wake me up, but I don’t like using foaming cleansers in the morning because it can be more drying. The cooling sensation is derived from menthol, which can be irritating if it gets anywhere near the eyes. While I enjoy the foamy consistency, I don’t love this cleanser. It does clean but I find it almost a bit too strippy for me. I think it might be better for someone with normal to combo or oily skin. I have dry skin so it’s not the best for my skin type. Ingredients: Aqua (Water/Eau), Stearic Acid, Myristic Acid, PEG-400, Potassium Hydroxide, Glycerin, Lauric Acid, Lauryl Hydroxysultaine, Methylpropanediol, Glyceryl Stearate SE, Menthol, Tocopheryl Acetate, Amaranthus Caudatus Seed Extract, Ulmus Davidiana (Elm) Root Extract, Butylene Glycol, Polyquaternium-51, Avena Sativa (Oat) Kernel Extract, Beta-Glucan, Cynara Scolymus (Artichoke) Leaf Extract, Hydrogenated Lecithin, Pteris Multifida Extract, 1,2-Hexanediol, Parfum (Fragrance), Phenoxyethanol, Disodium EDTA. The Lise Watier Gentle Rose Petal Scrub (C$26 for 150mL) was one of the two products that I was most looking forward to. This rose sugar scrub has real rose petals in it. Sugar scrubs are much gentler and hydrating on the face than salt scrubs (I would never use a salt scrub on my face, ow!). It smells amazing and does a great job at exfoliating without overdoing it. The sugar bits melt after you’ve been massaging for a bit, and my skin is left feeling super soft and silky. I don’t really use physical scrubs anymore, preferring chemical peels, but this one I still reach for in place of my glycolic peel because the rose scent is just too much of a delight not to use. Ingredients: Glycerin, Sucrose, PEG-32, Aqua (Water/Eau), Polyglyceryl-10 Behenate/Eicosadioate, Diglycerin, Polyglyceryl-10 Stearate, Rosa Gallica Flower Powder, Silica, Parfum (Fragrance), Ethylhexylglycerin, Potassium Hydroxide, Acrylates/C10-30 Alkyl Acrylate Crosspolymer, Phenoxyethanol. The Lise Watier Soothing Rose Petal Gel Toner (C$26 for 150mL) was the other of the two products that I was most excited to try. This reminds me of the Fresh rose toner that has the real rose petals floating in it, but this is more of a thicker, gel consistency. I love this. It’s very hydrating and leaves my skin feeling super plump and happy. I generally prefer to apply this type of thicker toner by patting it on my face, but I feel like the rose petals don’t really dissipate that way, so I use this primarily with a cotton pad at night after cleansing. For a winter toner, this is perfect. It smells amazing too – very fresh and rosy. Ingredients: Aqua (Water/Eau), Methylpropanediol, Glycerin, Pentylene Glycol, Rosa Gallica Flower Extract, Saccharomyces Ferment Filtrate, PEG-40 Hydrogenated Castor Oil, Trehalose, Acrylates/C10-30 Alkyl Acrylate Crosspolymer, Tromethamine, Allantoin, Ethylhexylglycerin, Parfum (Fragrance), Disodium EDTA, Phenoxyethanol, Citronellol. Of the four products, I would say buy for everything except the Cooling Cream Foam Cleanser. There are other drugstore cleansers out there that is more cost effective and works about the same or even better. You can purchase these products directly from Lise Watier, or from London Drugs. For the holidays, Lise Watier has released a limited edition set (C$69) that contains three out of four products. I’m a bit disappointed to see that the Rose Petal Scrub was not included in the set since it is my favourite product from the line, but this kit does have all the basic products in it to complete the first three basic daily steps of your skincare routine. The kit is amazing value at just $69, so you essentially save $18 or 21% off the purchase of all three products. The Rose Petal Scrub is not super pricey on its own, so it could be an add-on product to the kit. Is anyone else like me and love using lots of active ingredients in skincare during the fall / winter months? 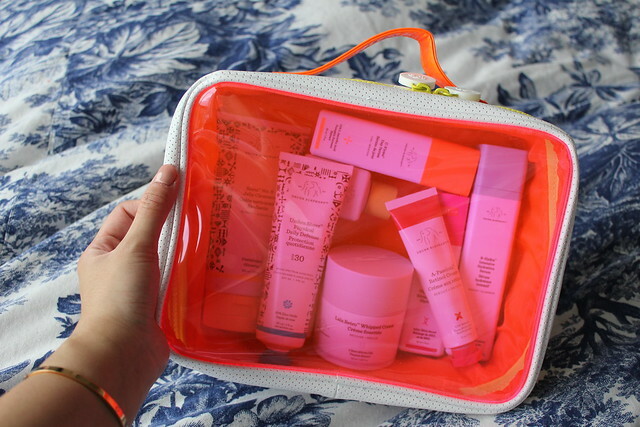 I tend to go gentle with the active ingredients in the summer because most products make my skin sensitive to the sun, so I will store those products away until later in the year. One of the things I look forward to the most each year is when I break out my retinol and slather it all over my face. Retinol is hands down my favourite skincare ingredient because it makes my skin look and feel so incredible after just one use. 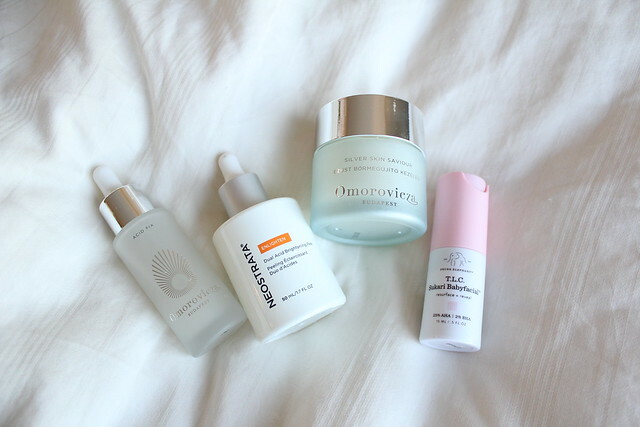 In addition to retinol, I also use vitamin C, and AHA/BHAs in my every day skin routine. 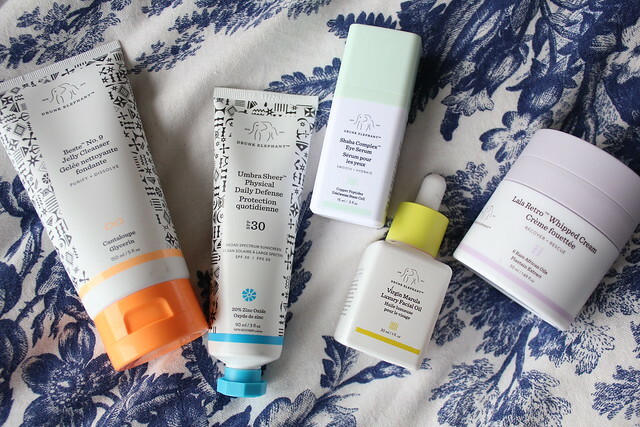 Today I wanted to talk about some of the vitamin C serums that I’ve been using lately. Vitamin C is an incredible anti-oxidant to help prevent aging, and also combat against pollution and sun damage. 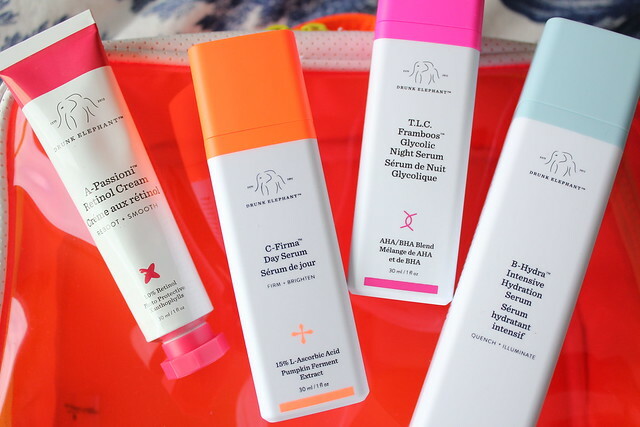 I use vitamin C products during the day (with copious amounts of sunscreen… SPF 50 every day!) as a serum, layered on top of my pre-serum, essence, and underneath moisturizer and sunscreen. The one I’ve been most frequently reaching for is the ultra-popular, the one everyone knows about – Skinceuticals CE Ferulic (C$175 for 30mL). This is a cult classic product, and for good reason. It contains 15% pure vitamin C (L-ascorbic acid), 1% vitamin E (alpha tocopherol), and 0.5% ferulic acid to help prevent signs of environmental (sun, air) damage. This product is primarily for prevention, so I don’t expect to see massive changes to my skin health. That being said though, I do really enjoy using it and my skin feels comfortable every day. This product is expensive, and before I received a bottle from PR, I cheaped out and purchased a “dupe” that was just a fraction of the price. 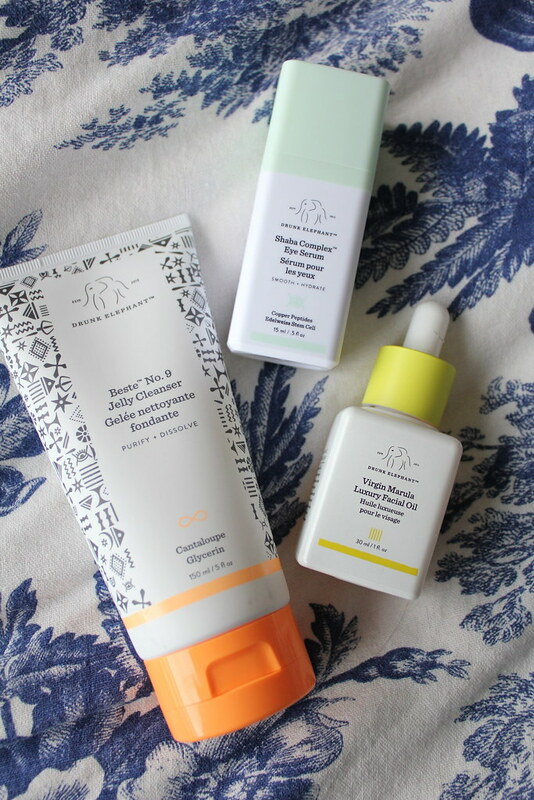 There are several dupes on the market that contain a similar blend of vitamins C and E plus ferulic acid, BUT after using both the original and the dupe, I highly recommend just splurging for the original. 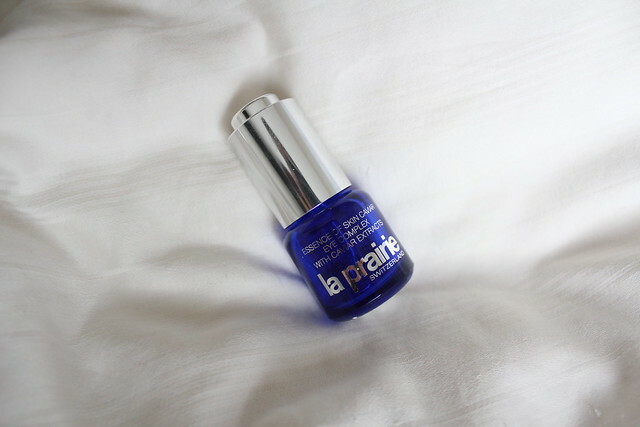 The original serum is super lightweight, sinks right into my skin with zero stickiness. The L-ascorbic acid grade in Skinceuticals is also much more stable than ones you would find in cheaper dupes, so it didn’t oxidize on me as quickly as the dupe did. I only managed to get 2 months of use out of the dupe before it went completely orange on me, not only in the bottle, but leaving a really ugly orange stain on my skin. The dupe was also noticeably thicker and also left my skin feeling super sticky. I didn’t enjoy the dupe, so even though it was cheaper, I wasn’t reaching for it and it also went bad on me really quickly, so it ended up being a waste of money anyways. The one thing I don’t particular love about this product is that its in an open dropper. Vitamin C oxidizes easily so I would have preferred it to be in an airless pump. AlumierMD EverActive C & E (C$179 for 45mL) is a product I’ve just recently been introduced to. Similar to Skinceutricals CE Ferulic, this product contains 15% L-ascorbic acid and vitamin E. It also contains Matrixyl, which is an anti-aging ingredient which targets lines and also improves elasticity in skin. While other products come already pre-blended, the EverActive C & E comes in three separate unblended vials of 15mL each. The L-ascorbic acid powder is stored in a chamber at the top of each bottle, and you need to pop it, and mix it together with the rest of the solution before applying. The purpose of this is so that you get the freshest product possible each time you use it. Each 15mL vial is supposed to last you one month, but I found that this actually lasted me longer than a month. It also makes me feel less guilty if I take my time in finishing my products, since the vials stay fresh for a long time unless you’ve mixed it. I find the EverActive C & E to be much more moisturizing than other vitamin C serums I’ve used. This makes sense because it is targeted towards a more mature audience with the addition of Matrixyl. Lastly, we have Derma E Vitamin C Concentrate (C$34 for 60mL). This is a hyaluronic acid serum that contains Vitamin C. It is the most natural of all these products, the most inexpensive, but also the least clinical. The texture is a very lightweight gel that is lightly moisturizing, and also smells very fresh. It doesn’t leave any residue on my face, as it sinks it completely, leaving my skin feeling smooth and plumped. I feel like this is probably a good entry-level vitamin C product, as it is relatively affordable. Over time, I do feel like my skin has gotten brighter with continuous use. You get fantastic value with this product as well, since it comes in a bottle that is double the size of most serums. I am new to Derma E, but its products are generally very natural and contains mostly plant essential oils. Each of these vitamin C serums have their benefits and drawbacks: Skinceuticals is great for all skin types but is purely an anti-oxidant serum; AlumierMD is great for anti-oxidant and also anti-aging; and Derma E is great for younger skin who want the benefits of vitamin C serum without spending a fortune and can also provide moisturizing benefits. Of the three, my personal favourite is the Skinceuticals, but the Derma E is a close second. I could see someone my mom’s age really enjoying the Alumier, as it will help repair some of that lost collagen in their skin. You can purchase Skinceuticals from their website, AlumierMD from your skin expert’s office, and Derma E from London Drugs. What are some of your favourite vitamin C serums? Products featured were provided by PR for review consideration or as media event gifts; all opinions are my own. If you were following along on my Instagram Stories a while back, I joined London Drugs at their annual LD Beauty media event in Whistler. This is my sixth or seventh year attending, ever since the inaugural one. I’ve cherished my relationship working with the London Drugs team, and I always look forward to seeing what’s new at London Drugs every year. You know me, I absolutely love skincare, so when we were at the event, there were several skincare items that really caught my eye. First, the Elizabeth Arden Retinol Ceramide Capsules Night Serum (C$106 for 60 capsules) is something I’ve been dying to get my hands on. This is an upgraded version of their Ceramide Capsules, and they’ve included retinol in it for maximum anti-aging. The delivery system is still the same as the original version – you use one capsule per application. I love retinol so I was super excited to get to try this. I’m not a huge fan of the texture, it’s quite silicone-y, but I have confidence that over time, the retinol will help smooth my skin. If you’re not a fan of the silicone-y texture, StriVectin has a new STAR Light Retinol Night Oil that is launching soon in Canada. You can use this as the last step of your night time skincare routine, either mixing it in with your moisturizer or on its own. I haven’t used this yet because I’m still in the process of finishing up another retinol product. I love Sunday Riley Luna, which is a retinoate night oil. I’m really looking forward to seeing how this product will improve my skin texture. Honestly, retinol is one of my favourite ingredients right now to use on my skin because I am trying to prevent aging – I do believe that prevention is key when it comes to lines and wrinkles. NeoStrata recently revamped their entire line, categorizing their products neatly into different skin concerns, and repackaging everything in colour-coded packaging. I received a bottle of the Enlighten Dual Acid Brightening Peel (C$80 for 50mL) to try out. This product is super easy to use, just use the dropper to apply some product on a cotton pad, swipe over skin, wait 5-20 minutes (depending on how tolerant your skin is to acids) and then rinse off. I literally ripped this one out of its packaging when I first got home, and I have to say it is super easy to use. 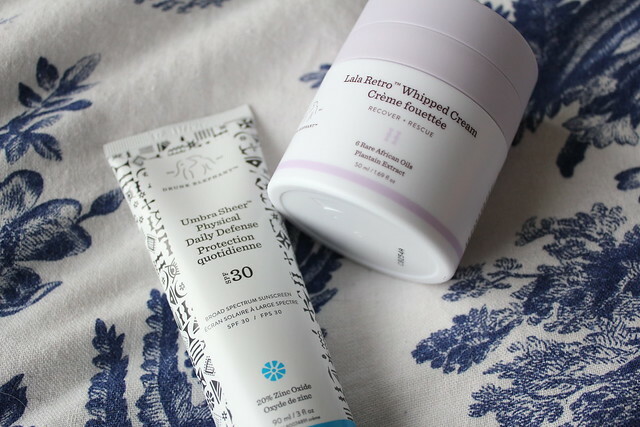 My skin likes acids (I love the Drunk Elephant Sukari Babyfacial mask that is 25% glycolic), and it loves the 20% AHA/PHA formula of this one. If you’re not used to strong acids, your skin might tingle a bit, but mine was fine. I started only by leaving this on for 5 minutes, and then increased it to 20 minutes after a few uses. Honestly, I love it. Since we don’t have the Drunk Elephant glycolic mask here, this is a perfectly fine substitute, and is actually easier to apply and rinse off compared to the DE one. My skin feels softer and smoother the next morning. I haven’t noticed any brightening benefits yet, but I’m addicted even just for the line-smoothing benefits. It also comes in a Clarifying formula, for pore and oil reduction; as well as Anti-aging, for pure anti-aging benefits. Vichy Aqualia (C$40 for 50mL) was one of the first moisturizers I purchased for myself in university. They recently reformulated the entire line such that it contains more natural ingredients. They also repackaged so it looks more streamlined and sleek. Almost 10 years later, I still love Aqualia. It is honestly the perfect moisturizer for young, or moisture-lacking skin. The Aqualia Thermal moisturizer comes in light cream, gel cream, and rich cream formulas, so you can choose the one that works the best for your skin. 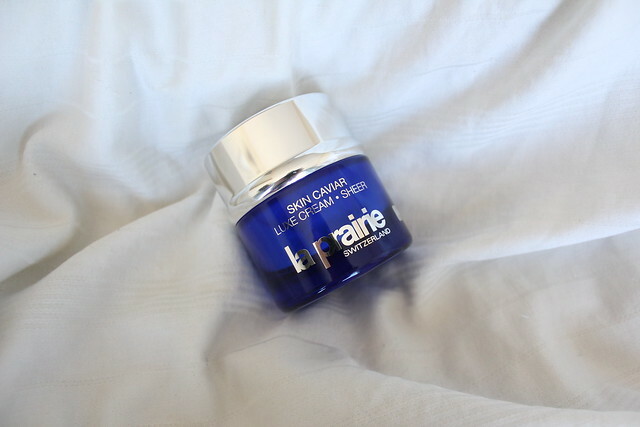 In the winter and at night, I love the rich cream formula. During the day and in the warmer months, I prefer the light cream. Both give me amazing hydration that lasts all day. I also love using this with my Vichy Mineral 89, which is my #1 favourite product from Vichy as it is fantastic at keeping my skin nicely balanced and hydrated, as well as acting as a good base for other skincare products to layer on top. Similarly, Clinique’s Dramatically Different Moisturizing Gel was something that I used in university. I loved this lighter version over the original Lotion. Earlier this year, Clinique launched the Dramatically Different Hydrating Jelly (C$36 for 125mL), a 100% transparent clear gel that can be used as a moisturizer for oily / combination skin, or as a serum for those with more dehydrated or dry skin types. This has a very similar texture to Vichy Mineral 89, where it feels almost like a water gel applied on your skin. When I played with this on my hand, it felt pretty hydrating and very light. I personally will use this as a hydrating serum; it layers pretty well over / under other products. Not to mention this is such incredible value – you get 125mL of product for just $36. Clarins makes one of my favourite face serums – the Clarins Double Serum (reviewed here). Recently they reformulated their Pore Control Serum (C$58 for 30mL), a skin-perfecting serum designed to reduce the look of pores. I understand that the newly reformulated product is good on all skin types, and isn’t particularly mattifying. They wanted to recreate this so that all skin types can use this because not just those with oily skin have concerns with the appearance of pores, so this product was created to be gentler for even the driest or most sensitive skins. My pores aren’t a huge concern of mine, so I haven’t personally tried this product on me. But I did play with it a bit and I like the texture – its very light and isn’t super mattifying, so if I do decide one day that pores are a concern, I could use this. Lastly, Bioderma is launching a new Atoderm SOS Spray later this year. This product is so interesting because it is an Anti-Itch spray that can be used on dry spots, eczema, insect bites, basically anything that will cause itchiness. I tried this on my boyfriend’s eczema and he is already liking it. If you’re going on a tropical vacation, this is a must have because it will prevent insect bites as well as hydrate the skin. Which of these products would you want to try? Everything with the exception of the Clarins Pore Control Serum were provided as gifts from a London Drugs media event. The Clarins Pore Control Serum was provided by their PR for review consideration. all opinions are my own. I have a new product launch to tell you guys about today. The French-Korean brand JOWAÉ is launching exclusively at Shoppers Drug Mart and beautyboutique.ca soon. French pharmacy skincare is legendary, and JOWAÉ is created in collaboration with a Korean pharma lab which specializes in ancient Korean ingredients such as tea and ginger extracts. 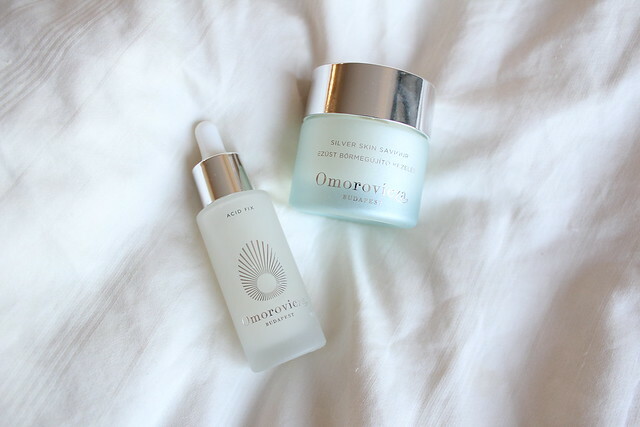 I love both French and Korean skincare, so this is a match made in heaven for me. 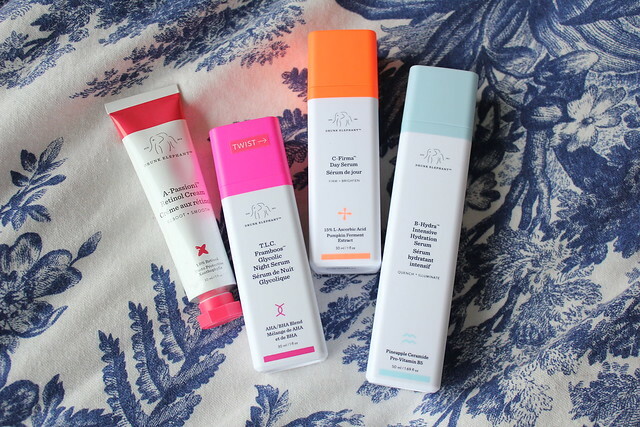 While I haven’t played with these products long enough to give a full review, I did want to write about these as soon as possible because they are launching at Shoppers soon. We in Canada are the first market in North American to be getting it, which is super exciting. JOWAÉ is a pharma-skincare brand, so you’ll find it along with other French pharma brands such as La Roche-Posay, Vichy, and Bioderma. The star ingredient in JOWAÉ is Lumiphenols from succulents. This ingredient is antioxidant ingredients that help to brighten and prevent aging. Patent-pending to JOWAÉ, this ingredient is in every product released by the brand, from face care to body care. In addition to the high functioning ingredients, the line is also formulated for the most sensitive of skins, and is also vegan. The only thing that concern me a bit is that fragrance is pretty high on the ingredients list, but I was assured that whatever fragrance in the products come from natural sources. The products in this brand all contain 80%+ ingredients from natural origins, which is promising. Korean skincare routines usually are very long and elaborate, with each step fulfilling a specific purpose. For the modern woman who may not have a lot of time on their hands to do the full routine, JOWAÉ has narrowed it down into just four simple steps. 1. Cleanse – depending on your skin type, there are two different cleansers available. There is a Soothing Cleansing Milk (C$21) for dry to normal skin types, or a Purifying Cleansing Gel (C$20.50) for combination to oily skin types. 2. Tone – there is an incredibly soothing and plumping Hydrating Water Mist (C$19), containing sakura water blossom. This contains 97% ingredients of natural origin, and comes in a convenient continuous spray. It is a fantastic product to help tone your skin, set your makeup, or for touch-ups during the day. The bottle is huge, so it’s not great for travel. I’ve really enjoyed using this, over the Evian water sprays, since this contains way more hydrating ingredients in the same convenient packaging with a super fine mist nozzle. I can see this being a fantastic product to take on the go with you, so I really wish they would eventually release a smaller size! 3. 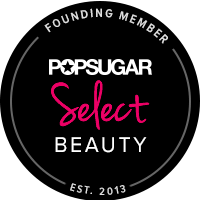 Serum – The Youth Concentrate Complexion Correcting (C$52) serum is a youth-boosting, brightening serum that is great for all skin types. Most brightening products don’t work well on sensitive skin types but even those with the most sensitive skin can use this. It contains white tea extracts to help protect against daily skin aggressors and also treat dark spots. 4. Moisturize – Depending on your skin type, there are three different moisturizers to choose from. 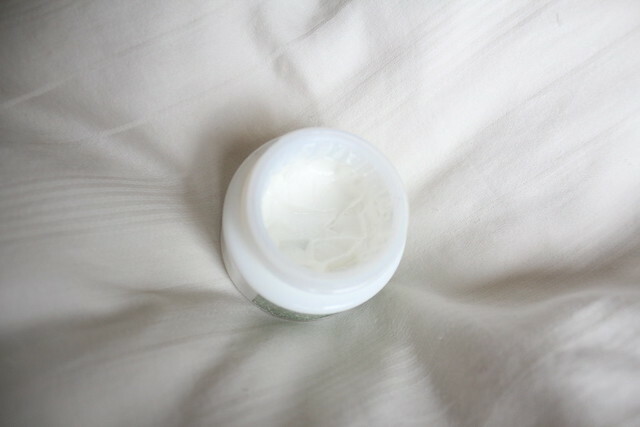 The Moisturizing Light Cream (C$30) is a simple hydrating moisturizer that is great for young people who are just starting to get into skincare. The Moisturizing Light Cream contains sakura blossom water to hydrate the skin. There are two Wrinkle Smoothing Creams (C$42), one Light Cream and one Rich Cream. The Wrinkle Smoothing Cream is great for those starting out an anti-aging skin routine, and contains red ginseng, a traditional Korean skincare ingredient. I love the rich, smooth texture of the Rich Cream, and this will probably be the one I will use during the winter months. In addition to the four basic skincare products, there is also a Wrinkle Smoothing Eye Serum (C$37), which also contains red ginseng. This eye serum is lightweight and a fantastic starter eye cream to prevent future fine lines and wrinkles. It is great under makeup during the day, as well as in the evenings. I honestly think that everyone should start using eye creams early on because you can’t fix wrinkles once they develop. Especially now in the age of computer and phone screens, your eye area will be more prone to lines. There are two body care products launching in Canada, the Hand & Nail Nourishing Cream (C$10), which contains camellia oil and 96% ingredients from natural ingredients, as well as a supersized Revitalizing Moisturizing Lotion (C$28) that comes in a massive 400mL bottle with bamboo water and 97% ingredients from natural origins. I tested both of these out at the launch event, and I’m impressed with them. The Revitalizing Moisturizing Lotion is super hydrating, and I can see myself keeping this on my office desk as a hand lotion – I wash my hands nonstop at work so I always love a huge bottle of lotion. The Hand & Nourishing Cream is fantastic for keeping in my handbag. It’s a great size to keep on the go, and I actually really look forward to taking this with me on my next travels. JOWAÉ is launching exclusively in North America at Shoppers Drug Mart and beautyboutique.ca with these ten products. If the launch does well, we may be seeing more products from the brand very soon. Product were provided by PR for review consideration; all opinions are my own.